Editor considers some more possibilities with the basic concept suggested in the last issue. 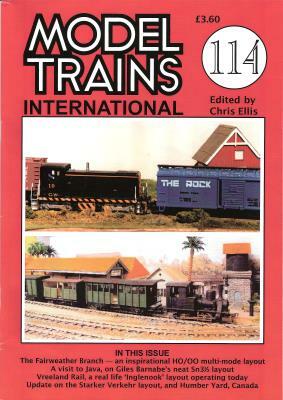 Editor looks at the famous little switcher, released in HO by Walthers. Steve Grantham gives an update on progress with his busy and attractive German HO freight yard layout. A current American short line, just four miles long, which operates in very simple 'Inglenook' style, described by Marshall Stull. Giles Barnabe tells the story of the research and construction work behind a Sn3&half; layout set in Java. Creating an HO scale VDA van from the Hornby Kellogg's closed van. The HO Canadian layout of Kirkintilloch Model Railway Club is an interesting variation on the 'Inglenook' idea which could be made in long or short forms. Gordon Avis built and describes his classic layout, a very compact American HO short line or British OO branch line only 4 feet long. What next? A simple but very operable small layout dependent on a sector plate proved to be a good idea, says Derek Ashcroft.